Automated Ultrasonic Examination of Inclined Nozzle Welds Using Robot and 3D Reconstruction. Recently, a state-of-the-art ultrasonic inspection of nozzle attachment welds to the main re-circulation loops within nuclear power plants has been performed with an advanced inspection system. The advanced inspection has been performed through CAD modelling of the object, ultrasonic simulation, scan path generation, data collection with the new P-scan generation, 3D ultrasonic reconstruction and 3D data analysis within UltraSIM. The capabilities of the advanced inspection have been tested on open test blocks with known defects. Automated ultrasonic examination of complex geometries often requires development of procedures and equipment, and therefore, FORCE Institute has developed an advanced inspection system, which makes inspection of complex geometries such as nozzle attachment welds more reliable. The advanced ultrasonic inspection system has proved to fulfil the inspection requirement through examination of open test blocks and on-site ultrasonic examination of inclined nozzle welds. The advanced inspection system consists of CAD modelling, ultrasonic simulation, scan path generation, data collection with the new P-scan generation, 3D ultrasonic reconstruction and 3D data analysis within UltraSIM. 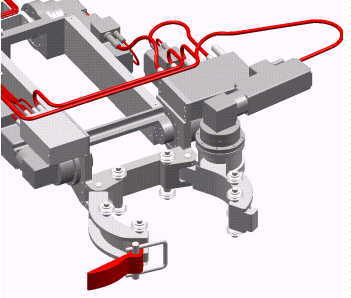 A 3-D CAD model is prepared for the inspection object e.g. 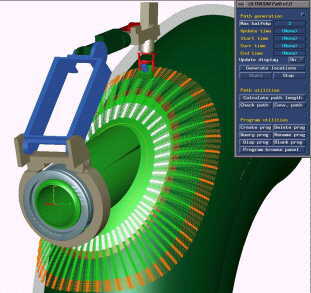 the inspection pipe to elbow, including artificial reflectors, and the model is transferred to our ultrasonic simulation program - UltraSIM, which is an application module within the ROBCAD® robot simulation software running on a Silicon Graphics workstation (SGI). Fig. 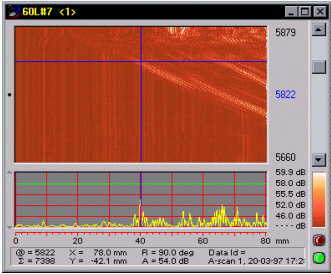 1: Automated scan path generation and collision check before ultrasonic inspection. Fig. 2: The P-scan System 4, PS4, with more inspections at the same time. Fig. 3: Advanced Inspection Robot AIR-1, built from standard link modules. Fig. 4: 3 D Reconstruction and data analysis. The ultrasonic beam propagation is simulated in a 3-D CAD model and based on the artificial reflectors, UltraSIM calculates the optimum transducer positions and transducer angles automatically in order to ensure complete coverage of the examination volume, which is specified by the operator (fig. 1). Based on the calculations, scan path programs (robot motion) are generated for the advanced inspection robot, AIR-1. The robot motion is simulated on the 3-D CAD model in order to prevent collision with the inspection object. If the robot simulation reveals collision with the inspection object, the necessary adjustments are made prior to the ultrasonic examination. The principal equipment for ultrasonic examination of the welds is the P-scan system, PS-4, which is a computerised ultrasonic system, developed by FORCE Institute for automatic, mechanical or manual ultrasonic examination of welds and materials. The system has documentation and storage facilities for all data related to each inspection operation, and includes visualisation of the inspection results in the form of images of the material volume examined. The ultrasonic examination system provides many new features, which allows the operator to perform several inspections simultaneously (fig. 2). Both pulse-echo and time-of-flight-diffraction technique have been applied for inspection of the inclined nozzle attachment welds. The new generation of digitised scanners have motor modules, which may be linked together to form a scanner with many degrees of freedom. The Advanced Inspection Robot AIR -1 is an articulated elbow type robot manipulator with 6 degrees of freedom (fig. 3). This means that the robot has 6 individually independent rotational joints and that within its workspace the robot can reach any point with any orientation with a NDT-probe mounted on the output tool flange located at the end of joint 6. 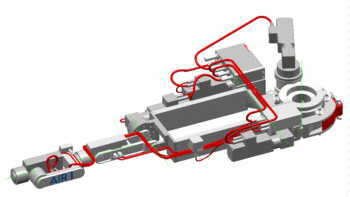 The robot motion (scan path) is controlled from the ROBCAD® robot simulation software running on a Silicon Graphics workstation . Ultrasonic data collected by means of the P-scan system 4 and the advanced inspection robot is displayed in the 3-D CAD model of the inspection object, which means, that defects are shown at their correct location in the 3-D CAD model (fig. 4). The processing of the collected A-scan is performed by UtraSim Recon module. The advanced inspection system was designed to fulfil the Swedish requirements (SKIFS) and therefore the inspection techniques have been verified on full scale test block (open test block). 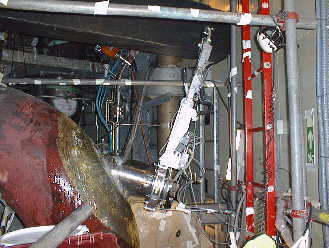 A full scale test block was fabricated of the same material (cladded carbon steel) and the same weld preparation as the inspection nozzle to elbow weld within the nuclear power station. Furthermore, the open test block had 19 known defects such as cracks, lack of fusion, slaggs and pores. The ultrasonic examination procedures and equipment have been developed for detection of defects, larger than 2 mm in height and 8 mm in length. In similar qualification projects, the height sizing of defects has been within ± 2.3 mm (fig. 5) and length sizing of defects has been within ± 18.5 mm (fig. 6) of the actual defect measurement. Fig. 6: Length sizing of defects in a similar project. Fig. 7: Small diameter mounting ring to be fixed on inspection object. 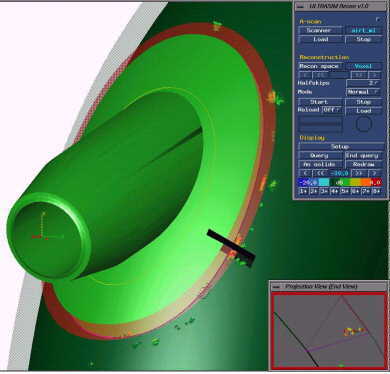 Prior to the ultrasonic examination at the nuclear power station pipes and other obstructions are included in the 3-D CAD model, and the final robot simulation (collision check) is performed. The robot simulation has many advantages such as preventing a collision with an inspection object and other known obstructions, and most important, reduction of the time needed in a high radiation area. The 25 kg aluminium Robot is easy to mount on the inspection object through a carbon steel mounting ring (fig. 7). The rings are made of two half parts, making it possible to mount the rings on the nozzles, when pipes are welded to the nozzles. The ring is fastened to the nozzle by turning fastening screws, thereby pressing pads integrated in the rings against the nozzle surface. The robot is running on two V-shaped tracks on the rings. The wheels are mounted on the robot base arms. For mounting the robot, the arms can be opened releasing the latch clamp on the arm (fig. 8). Due to the low weight (25 kg) and length (1.4 meter), the robot can easily be moved round obstructions such as pipes, lathers etc. (fig. 9). Initially, the robot is mounted in a known position, in this case an up right position (fig. 10), for calibration of the 6 axis. 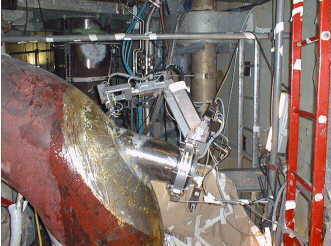 Once the robot is calibrated, the ultrasonic examination is controlled remotely (fig. 11 - 14), and the nozzle weld is examined within 12 -14 hours. 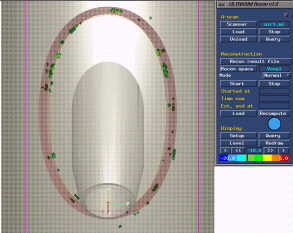 During the ultrasonic examination the data is processed and displayed in the 3-D CAD model of the inspection object (fig. 15 - 16). As the P-scan system collects all ultrasonic signals (120 dB dynamic range) the display level (gain) may be varied by the operator during data analysis. Fig. 8: Robot base arms opened for installation on the mounting ring. Fig. 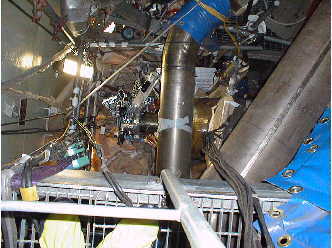 9: Robot installed on the main re-circulation loop, Sweden. Fig. 10: Robot mounted vertically for calibration prior ultrasonic inspection. Fig. 11: Robot moving into position for nozzle weld inspection. Fig. 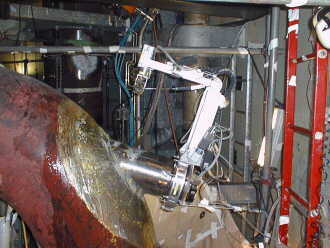 12: Robot moving into position for nozzle weld inspection. Fig. 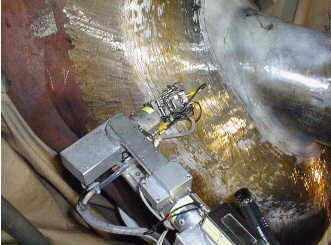 13: Automated ultrasonic inspection of nozzle attachment weld. 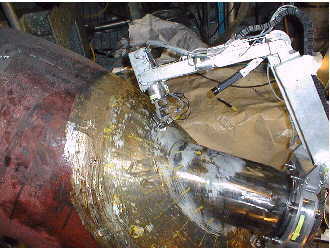 Fig.14: Automated ultrasonic inspection of nozzle attachment weld. Fig. 15: Automated ultrasonic inspection results displayed in UltraSIM. Fig. 16: Automated ultrasonic inspection results displayed in UltraSIM. Automated ultrasonic inspection of complex geometries such as the inspection nozzle welds has proved to be reliable performed with the advanced inspection system, which consist of the new P-scan system, PS-4, and the advanced inspection robot, AIR-1. In spite of the complexity and the high performance of the system, the operators only need to install the remote controlled "front-end" and the inspection robot, not more than 31 kg, in the radiation area. The CAD modelling of the object, ultrasonic simulation, scan path generation, data collection with the new P-scan generation, 3D ultrasonic reconstruction and 3D data analysis within UltraSIM fulfil the requirement to a state-of-the-art inspection equipment, where the examination procedures are validated prior to on-site examination. The advanced inspection system may be utilised for several inspection tasks such as eddy current and automated ultrasonic examination of complex geometries. Some of the future projects are qualification of procedures, equipment and personnel for the pressurizer spray nozzle attachment welds, inspection nozzle welds, and inspection of nozzle inner radius inspection.